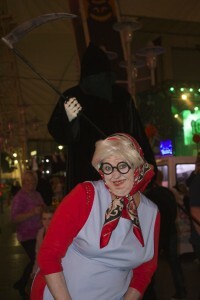 This week at Butlins Bognor Regis we have seen some spooky things going on around resort. From pumpkin scarecrows and scary masks to old ladies being followed by the grim reaper and ghoulish creatures hiding in the Fairground! Full of spooktacular songs and dances I loved Billy’s Frightfully Fun Halloween Show! Billy and Bonnie looked great in their Halloween costumes but my favorite character was Pumpkin Patch taking the stage by storm with his strong West Country accent! With the activities team in the Beach House, I got to take part in a pumpkin carving session! We had so much fun learning how to carve pumpkins into scary faces! This year, Butlins Bognor Regis alone, ordered over 550 pumpkins and nearly all of them have gone! It seems I haven’t been the only one to enjoy creating these bright orange vegetables into scary monsters! If you need some help carving your pumpkin, click here! For me, the best bit about Halloween, is making costumes and accessories that you can scare your friends with! 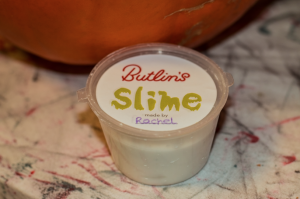 This year, I got to join an activities session to make extra gooey Halloween Slime and it was so much fun! I made white slime this time but you can make it in any colour! Click here to see how! My favorite part of this years Halloween has been the late night Funfair! Our team have created some epically creepy costumes and turned Sir Billy’s Fairground into a fearsome world of fun for all the family. After dark the infamous Helter Skelter lights up and creepy crawly ghoulish beings crawl out from under the stairs! Scary Costumes on Hook a Duck! Scary Costumes in the Fairground! We would love to hear your highlights of Halloween to! Post them on our Butlins Facebook page or Tweet us using the hashtag #ButlinsHalloween!